While OnePlus has outgrown its roots of aggressively-priced phones, it still offers a hardly-beatable value for money that makes its products desired despite the multitude of scandals that seem to plague the company's reputation on a regular basis. With each and every year, OnePlus has become more and more capable and its products have recently really outdid themselves - save for a few issues and shortcomings in-between, OnePlus has been mostly killing it in the affordable super-flagship segment. Take the OnePlus 5T, for example, a phone that employs all the signature OnePlus features like the mute switch, the customizable stockish custom Android experience, and finally, the unrivaled value for money that you can hardly get even with more expensive phones from other brands. The OnePlus 5T is a great device, but you know what device will probably surpass it? Why, the OnePlus 6, of course! The device is getting announced today, May 16, and it's time to revisit all the rumors and leaks pertaining to the next "flagship killer". Judging from all the leaks, OnePlus could be preparing a paradigm shift and forego the predominantly-metal design it has been utilizing for the past 2 years. While the OnePlus 3, 3T, 5, and 5T all had that all-metal body going on for them, OnePlus could be going the same way as many of its rivals and grace the OnePlus 6 with what seems to be a curved glass back with metal frame on the sides. That's pretty much what Samsung, Apple, and many others have recently done in the ultimate quest of fleshing out the most premium phone out there. OnePlus going full glass is still a wild rumor at this point, but it makes a lot of sense: while its flagships have been sufficiently powerful and capable, they have generally lacked any pizazz. Don't get us wrong, that's not a bad thing, but seeing OnePlus strives tooth and nail to become mainstream, it would make a lot of sense for it to spice up the design of its phones with a brittle, yet snazzy glass exterior. Just as one might expect from a flagship phone that is to launch in 2018, a bezelless design will likely be utilized. The OnePlus 5T was already a pretty efficient device when it came to screen-to-body size ratio, but the leaked images of the OnePlus 6 tells an even more impressive tale. We will be quite impressed with OnePlus if it really slims down the bezels of its next flagship phone to an extent similar to the one in the initially leaked image. 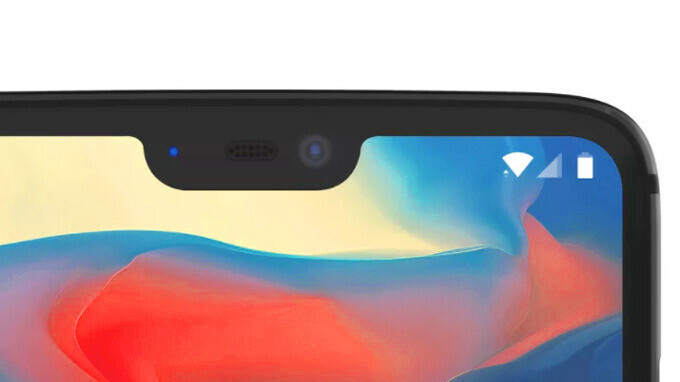 In late March, we received official word that the OnePlus 6 will indeed be writing a love letter to the iPhone X's notch albeit a bit smaller than Apple's undertaking. OnePlus' Carl Pei released the image above saying that “what you are essentially doing is moving the entire notification bar up, giving users more content on their screen.” Putting things from this perspective, it was an easy choice for OnePlus to adopt the notch and give users the maximum screen space. Further down the line, the leaked OnePlus device features a slightly-protruding dual camera that looks quite similar to the setups we've seen on the OnePlus 5 and the 5T. Just beneath them one could make out a concave fingerprint sensor that looks like it's well-separated from the surrounding glass and would be easy to locate without much fumbling. While we can't really make out the signature OnePlus mute switch on the side, it's unlikely that it will get axed down. After all, it's one of the most useful features of OnePlus' phones and doesn't really have an analogue on the Android market. It also seems that one of the devices that is expected to donate its general design to the OnePlus 6, the Oppo R15, has been recently teased sporting a notch. Normally, Oppo's flagships share a ton of similarities with OnePlus' phones as both companies are owned by the same conglomerate - BBK Electronics - and regularly collaborate on their devices. Take a look at the Oppo R15 and R15 Dream Mirror edition right below to see what the OnePlus 6 would probably end up looking like. The glass back that could grace the OnePlus 6 hints that the phone could potentially come with wireless charging on deck. Now that Apple has embraced this technology, it's cool once again and Android manufacturers are quite possibly way more open to employing it in comparison with previous years. Will the OnePlus 6 have this? Probably. As we mentioned, the OnePlus 6 will most certainly come along with a bezelless and notched display similar to the one on the OnePlus 5T, aside from the newcoming notch, of course. We also mentioned the notch which should be considered a necessary evil that needs to be employed so that the front-facing camera, earpiece, and proximity sensors have somewhere to go. Yet, we can speculate that the company will continue to use those nifty Samsung-made Optic AMOLED displays it's been employing on its devices for quite a while. For years on end, OnePlus hasn't ventured past Full HD resolution for its displays and we don't think the company will employ a sharper Quad HD panel as the cons likely slightly outweigh the pros. What we do hope is that OnePlus continues to improve its color calibration methods and still offer its users a choice between an accurate sRGB color mode and a more punchier and vivid one for all those who crave for more oomph. As far as specifics go, we expect a 6.3-inch Super AMOLED display with a resolution of 1080 by 2280 pixels, making out an 19:9 aspect ratio. For yet another year, OnePlus refuses to bump the resolution past 1080p Full HD, and we are perfectly fine with that - Quad HD might look nicer, but has its experience-breaking drawbacks. Oh, and talking about displays, a certain rumor exists that says OnePlus could be one of the first manufacturers to use a fingerprint scanner embedded into the display. Of course, this is contradicting with the leaked image which clearly shows a rear-positioned fingerprint scanner, and it's clear as a day no one needs two of these on a phone. We've seen prototypes with other devices with fingerprint scanners on board, the freshest one being the conceptual Vivo X20 Plus that was showcased at MWC 2018. Given that OnePlus is using OLED displays, which are a prerequisite for certain in-display fingerprint scanning techs to work, this rumor is not at all unsubstantiated. Yet, we wouldn't put our money on that. From the get-go, OnePlus raised the bar rather high by claiming the OnePlus 6 will boast a camera that will rival the Google Pixel 2/Pixel 2 XL and the iPhone X. This has us pumped up about the handset, as traditionally, OnePlus devices flaunted merely "good" cameras that simply lacked something. The OnePlus 6 will certainly boast a dual camera, just like its predecessors. Dual cameras come in all shapes and sizes, but the difference between the OnePlus 5 and OnePlus 5T was much more drastic than meets the eye. While the older device had a dual setup that paired a regular camera and another one with a longer focal length, the OnePlus 5T ditched the longer lens for a secondary one that had a wider aperture and aimed to fire up in in low-light scenarios. Why are we telling you this? Just to illustrate the point that when it comes to cameras, OnePlus is very open to experimentation and there's no telling if the OnePlus 6 will retain the wide-aperture secondary camera or bring back an optical zoom one again. We'd argue that the overall camera performance of the OnePlus 5 was a bit more fleshed-out than the OnePlus 5T the secondary camera of which only works as intended in specific scenarios and doesn't improve things as much as expected. We are happy to report that OnePlus rarely skimp it on the hardware side. You always get the latest top Qualcomm chipset in the company's flagship phone, and paired with the lightweight interface, the device usually flies and feels snappier than its contemporary rivals. That's why we are almost certain OnePlus would go with the latest Qualcomm chip on the block, the Snapdragon 845, which has already been slated to appear in a trove of existing and upcoming Android top dogs. The chip introduces a welcome performance boost over the Snapdragon 835 that powered both the OnePlus 5 and 5T. With the OnePlus 5T scoring juicy 8GB of RAM in its top version, it's normal to expect a similar variation of the OnePlus 6 to also have that amount of multitasking prowess available at user's fingertips. Again, a 6GB RAM version of the device will likely be available in the base version of the device. While having 8GB of RAM will mostly serve a bragging service for many, it's nice to see OnePlus leading many of its rivals with that much memory available. Storage-wise, OnePlus will likely continue to offer 64 and 128GB of storage versions of its next phone, though we wouldn't be surprised if its decides to jump the gun and go for 256 gigs of the stuff, just like the most spec'd out version of the recently-released Galaxy S9/S9+. As far as one of the most important aspects of a modern phone - its battery - we have no clue what OnePlus is prepping. A sub-3,500mAh unit is probably a safe bet, but we are super-open to surprises. Now, one of the latest saucy rumors to tickle our eagerness for the OnePlus 6 is a hot new gossip that claims the device will offer ultra-fast Cat.16 Gigabit LTE connectivity, which would potentially allow the handset to achieve data throughput of up to 1000Mbps, or 1Gbps. This will most likely come as courtesy of the X20 LTE modem integrated in the Snapdragon 845 chipset the device will likely employ: offering peak downlink speeds of up to 1.2 Gbps and uplink of 150Mbps, the Snapdragon 845 has one of the fastest modems out there right now. This will be a first for the company, which has employed its previous devices with significantly slower modems. For instance, the OnePlus 5 and the contemporary 5T suport Cat.12 LTE connecitivity with downlink speeds of up to 600Mbps, whereas the previous-gen OnePlus 3 and 3T both had 300Mbps-capable Cat.6 LTE support. Now, if OnePlus' latest releases tell us anything, it's that the company has adopted a 6-month release cycle of its devices - a flagship in late May/early June followed by an improved version of the same device in late October/early November. And it seems the OnePlus 6 won't deviate from this trend - the device is getting announced on May 16. It's expected that in Europe, prices for the OnePlus 6 will start at €519 for the 64 GB variant, going up to €569 for the 128 GB one. Most likely, this means US prices for the 64 GB and 128 GB models will be $519 and $569, respectively. We were expecting the new phone to be a bit more expensive than the OnePlus 5T, and it looks like that's exactly what will happen (the 5T was launched last year starting at $499). If the notch part is true then Shame on them. They don't have to copy Apple's every goddamn move even the bad part like the notch. bruh... they've been the apple of android since the beginning... no sd card support and even a notification slider!!!! And the design of the back panel in the 5 and the 5t. Because no sd card support is an Apple only thing? No, they didn't. There were plenty of 'smartphones' before the iPhone without sd-card. LG G7 has a notch, Korean. Nokia X will have a notch, Finnish Asus Zenfone 5 has a notch, Taiwanese So how is this a Chinese companies matter to you? it is a Chinese phone at the end of the day...there will be no innovations, only reverse engineering. What more can you expect from a Chinese company? As someone who has owned god knows how many different kinds of phones from Apple,Samsung,OnePlus,Hauwei,LG,ZTE,HTC I can honestly say I love my OnePlus 5t yeah sure some phones do somethings better no 1 phone is the best at everything but for $500 it can't be beat. I’m an iPhone X user and I agree with this. If my family and I weren’t so tied into the ecosystem that’s the first phone I would go to. Lol, that big sh**ty notch looks good to you! Please go to doctor because I really think you have problem withs your eyes or with your brain. Bro,notch is actually sh**ty and these are my own thoughts that matches with others. I rather live with a little upper bezels (like any 18:9 phones expect those with notch and with big bezels even after having 18:9 display ). Because notch actually looks ugly to me. Ohh please, OnePlus 6 is not going to be launch as it is already available as OnePlus 5T and the new model name should definitely be OnePlus 7. Because there most criticised phone (OnePlus 2) is the only even no. Phone they launch and after that they don't launch OnePlus 4 because of it. So, please stop saying OnePlus 6 instead of OnePlus 7. The OnePlus 4 doesn't exist because the number 4 is considered unlucky and not well-received in China as it's associated with death. Aye, Same goes to Nokia 4. Very superstitious. But... Come to think of it, Xiaomi doesn't seem to have that problem. Xiaomi have had several phones in its lineup with number 4 in the model number. Mi 4, Redmi Note 4, Note 4X etc. And The Note 4, as we all know, is a super hit! It has a cult following in XDA. Oh well, G'Day! Yes, you do raise a very interesting point. The Note 4 is super-hip, I also happen to own one as a backup phone and it's up there with many higher-priced devices as far as overall features are considered. MIUI is definitely quirky, but I got rid of it as soon as possible and the abundance of custom ROMs on XDA has been truly life-saving. Immeasurable value for money phone! I do NOTCH like this stupid trend!... Notch cool at all!! Oneplus isnt that special, xioami mi7 and asus zenfone 5z are flagship phones with an affordable price too. Xiaomi mi mix 2s is affordable too! Personally I think Oneplus is in a very tricky spot. they need a couple of gimmicks to generate a buzz around the phone and they aren't Samsung (the gimmick king). If they don't get the right gimmick they may suffer. Priced to be Best seller?? ?